Who does not like their kitchen sparkling and shining with utensils and tools being all in place? Nobody! However, it’s not that easy to maintain the shine and keep it glowing. Especially a stainless steel sink. But there are some common polishing methods that are super usable to maintain a great Sink. Today, I’ll be telling you about two foolproof ways on how to polish a stainless steel sink. Make sure you check out the cool tricks. This is one of the most resulting technique you can try. You would need a list of things to go ahead with the process. Get a drill, polishing kits that are available for a cheap price online and a metal polisher. Also, make sure to have a clean cloth. The metal polisher you pick should be environment-friendly. Also, be sure to use some non-toxic products. There’s a bunch of these available for a less price. Now to get started you would have to attach the adapter to drill. You should make sure that the drill is completely tightened. It should not slide or come off while you polish. This will ruin the whole process. Now you need to apply the metal polisher. Put it on a polishing pad. You may also try applying it directly on the sink. Gently polish the surface. Once you are done, let the rough polishing step stop there. Now you need it to switch for a softer buffer. This would help you to get a more glossy and nice finish. Once polishing is over, use some clean water to clean the sink. When you use a chemical polishing agent include soap in the water as well. During the process, you should check if the pad is damp. It should be wet all the time to eliminate any chances of scratching. However, if you use a genuine polisher then there’s no need to do so. Simply add more compound again and again. This is one of the weirdest but effective methods to try for sink polishing. You are going to need a few regular kitchen items to make it work. Get some kitchen cleaner or simply warm soapy water. You’ll need a kitchen towel also. Get some flour and paper towel/soft cloth as well. Now to start polishing, you need to clean up the sink. Use the kitchen cleaner spray or soapy warm water to clean it thoroughly. Using ingredients such as vinegar and baking soda will also help. Once you finish cleaning get a clean towel. It’s time to buff up! Never avoid this step. You need to dry the sink properly before polishing it. You may find it peculiar but if there’s any residual of water, the flour will turn into goo. Things would turn out to be a disaster! So please dry it well and also don’t forget the sides. Check the top of the drain as well. Now it’s time to use the flour. Sprinkle some flour all over the sink. Dusting should very thick. Polishing at one time will be difficult. Try to complete it by going for half. Use soft fabric or paper towel to gently buff flour all over the sink. Imagine as if you are waxing a car. Keep on buffing that way and don’t ignore rim around sink’s top. Also, pay attention to other parts. Such as drain, knobs, handles, little groves where most of the time dirt hides. Gradually you’ll start to notice that the food is disappearing. Things will begin to shine now. At home, always go with this trick every once a month. I can easily handle micro-grimes in my sink with the help of plain flour! It absolutely pulls out any grime or dirt that a normal soap sponge duo won’t be able to achieve. check the best shaved ice machine for home. Club soda is one ingredient that can give your sink a great shine. Just rub the sink with it through a soft cloth. Adding two or three drops of olive oil into a fabric to buff the sink surface will work like magic. Your fixture and sink would sparkle! Do this after every clean up once the sink is well dry. See? 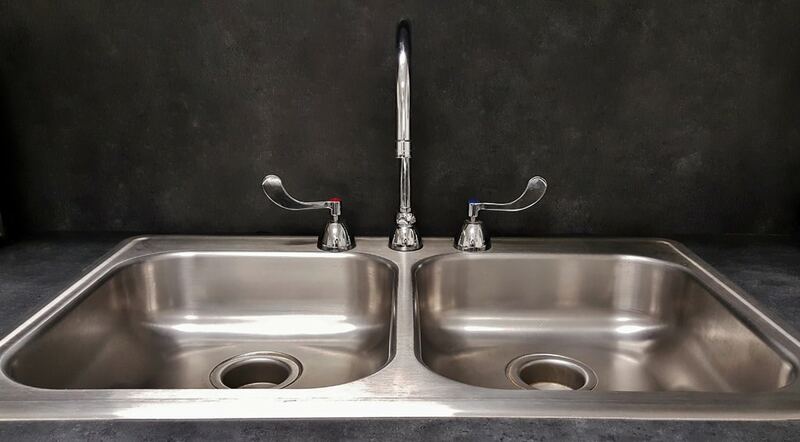 It’s super easy to polish a stainless steel sink. You only need to know the nitty-gritty. A sparkling sink will glorify your kitchen looks. Why let the visitors gaze at your house with a gloom and dull look? Glow the whole set up of your kitchen by barely shining the stainless steels. Anyway, you can use paint sprayer for kitchen cabinets. Especially That Sink! Good Luck!